What do you feel you will bring to the Australian Unit of Destruction? : One more member? Effort, co-operation. Where did you hear about the AUoD? : I heard about it from a few of my mates, crytical damage and jers, when we usually play online together they mentioned it. Why is it that you want to join? : Cause it seems like fun, have some more stuff to do when online. 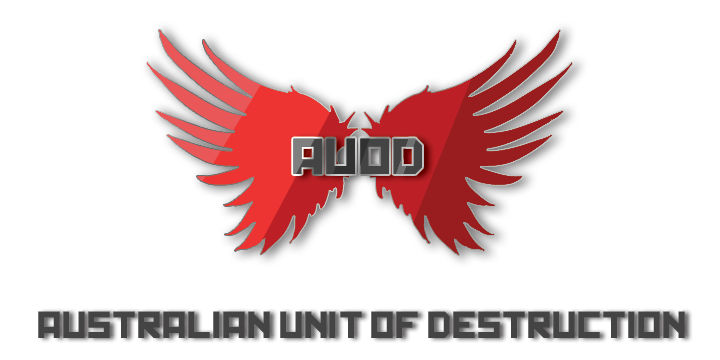 Will you remain committed to the AUoD website and in-game clan? ~ TDM, Wager, SnD, Dominations. ~ Just running maps, kill hunting. An admin should activate your account soonish. Make sure to stay active within these forums, we're a friendly bunch, really. Barely any of us play CoD anymore, we're all holding out for the next big multiplayer game, Battlefield 3, as far away as it is. But, we still play games of course. Welcome! Welcome, hope you can stick around unlike most people who seem to join lately. Either your account is activated or something happened because it was telling me "no such user exists." Welcome, Buffy! Hope to play with you soon. I activated him. Welcome, dude! We haven't had a newbie in ages. Look, Now you can change your tag to AUoD instead of us yelling at you everytime you try. Everything's funner at 1:21 AM. Welcome to the clan, mister. you guys playin Blops still? when are you on?